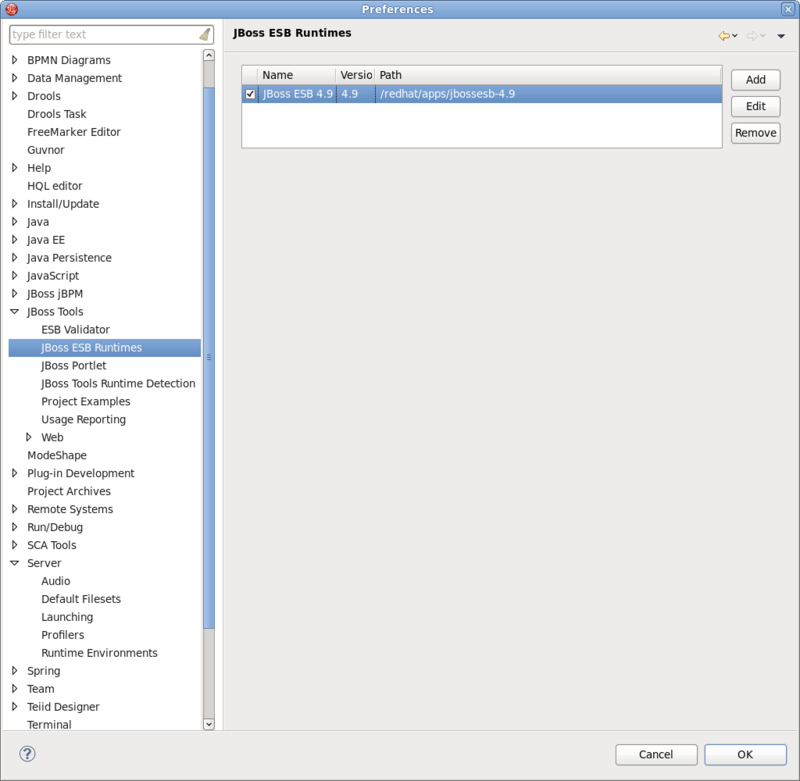 Click Window → Preferences → JBoss Tools → JBoss ESB Runtimes to open the JBoss ESB Runtimes page where you can add, remove and edit a JBoss ESB runtime. Select Add to open a dialog box where you can specify the JBoss ESB runtime location, name and version number. You can define the configuration if you specify the home directory as JBoss AS or SOA-P. If you select a standalone ESB runtime location, the configuration will be empty and can be ignored. You can also customize the libraries of the runtime by checking the Customize JBoss ESB Runtime jars box. The new JBoss ESB Runtime will be configured. Click Finish to finish and save the preferences. You can use the configuration when creating a JBoss ESB project. When an ESB runtime is configured for your project, you are able to modify it by using the Classpath Container page for ESB runtime. To do so, go to the Package Explorer view and right-click on "JBoss ESB Runtime" library. Select Properties and a table listing all available JBoss ESB runtimes will appear. Choose one of the runtimes to set to the ESB project and click OK. The ESB container allows Source and JavaDoc locations to be set via the Properties dialog on each contained JAR. Right-click on any JAR file and select Properties. Choose Java Source Attachment and select the location (folder, JAR or zip) containing new source for the chosen JAR file. You can do this using one of the suggested options (workspace, external folder or file). You can also enter the path manually. To change the Javadoc location, choose Javadoc Location and specify URL to the documentation generated by Javadoc. The Javadoc location will contain a file called package-list.